Today was the first day for Robert Scovill’s Complete FOH Engineer course. We arrived early this morning to find a 2″ thick binder specifically for our three days along with a copy of the Rane Pro Audio Reference. 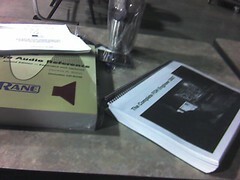 Today was about a 12 hour day, and there was a ton of information applicable to all styles of live audio. The bulk of the day was spent discussing system stuff and especially the time domain and bringing it under control. The idea is that you need to get your system setup right first, AND if you’re a mix engineer you need to be able to do this. We had Phase 101, 201, and 301. He had a cool story about a festival gig he did in New Zealand and how phase can play into your PA sound. Lots of cool stuff. There are concepts here that I can say I’m finally starting to understand now like line arrays. Scovi is a great teacher and takes the time to answer all questions and make sure you get it. his afternoon he did a cool alignment demonstration using just an impulse generator which was great because I’ve been looking for a way to audibly get our PA better in time with the drums so that I don’t need to use Smaart. I dig Smaart, but using it for backline alignment is a long process where using the impulse generator would be quick and easy. Incidentally, he helped me understand some stuff in Smaart today, too, that gave me some new ideas and approaches to using it. So far this is a GREAT course for live sound engineers. Brandon commented to me tonight that he got more out of today than three days spent at training seminars put on by one of our favorite equipment manufacturers. Even if we left now and skipped the next two days, I think we’d have enough stuff to keep us experimenting and refining things for quite a while. I’m still wrapping my brain around some stuff he Scovi talked about hours ago. It was very cool. After today, I feel a lot better about system alignment and optimization concepts and very confident in getting my hands pretty dirty in this area. I still wouldn’t consider myself an expert, but I definitely have some new tools in my bag that I can use now. Tomorrow we’re going to start getting into mixing philosophies and concepts which is going to be really cool to put on top of the stuff we went over today.